This just in from the good bacon loving folks at the Harris Grill. In honor of Thanksgiving this Wednesday (Nov. 25, 2009) will be Turkey Bacon Night – the turkey bacon starts at 8pm. Since you will probably be out and about visiting with those old high school prom dates and reliving memories that you probably would prefer to forget, you might as well be doing that with some bacon, in this case Turkey bacon. 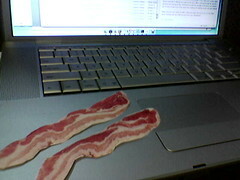 Because there are quite a few people out there that believe that bacon makes almost everything better. We’re letting our little pink pals off the hook for a very special pre-T-Day Bacon Night on Wednesday, November 25. That’s right: for the first time ever, Harris Grill will be ladling out the Turkey Bacon on Wednesday night just to get you in the mood. Bring your out of town guests in for a specialtreat starting at 8:00 pm, when we’ll also have the effervescent Miller Light Girills pushing lip-chilling aluminum pounders of Shadyside’s favorite get-the-job-done Lite beer. Seeking Shelter from the Family? And another important public service announcement for those of you who need to escape from your families after 12 fun filled hours of cooking, cleaning and turkey eating. The Harris Grill will open at 9pm on Thanksgiving evening to provide shelter and drinks for those who have had a little too much family fun! 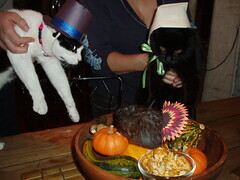 (the photo below came up when I typed “Thanksgiving Fun” into Flickr – yes, I think those are cats dressed up for Thanksgiving). Once you’re tired of all the family squabbling, swing on over to the Grill where we’ll be opening the bar at 9:00 pm to help you forget about the day. Dad’s just never gonna understand that surface piercing, but we’ll help you get over that. Bring your bartender a plate of leftovers and get a free shot of Imperial! Since I am writing about all of these nice things happening at the Harris Grill – I thought I would go ahead and share their list of seasonal beers too. The descriptions are also from the Harris Grill (If only I could be that funny and knowledgeable about beer). Great Lakes Christmas: it’s Christmas in a glass! Spicy, malty, and a real crowd pleaser. It outsells Miller, Budweiser, and Coors during the month of December in Ohio. We’re not saying all Ohioans have good taste, but this certainly shows a good effort. Arcadia Coco Loco Stout: triple chocolate stout, 7% ABV, delicious by itself or after a big ol’ Harris Grill Pot Roast dinner. Delirium Noel: a Belgian Strong Dark Ale that clocks in at 10% and sells out immediately. This will be available for a limited time in both draft and bottle. East End Snow Melt: This 7% winter warmer is a perennial favorite. We like it every year, too. East End Bigger Hop: We’re one of only seven sites in da Burgh where you can taste this outstanding brew from Scott Smith. ‘Nuff said.